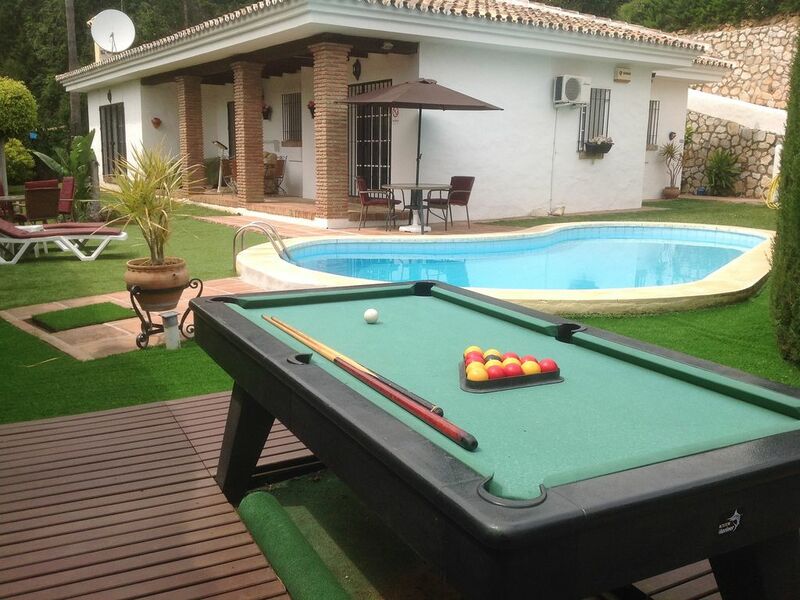 Fantastic Villa set in a lovely garden with everything you need to help you feel at home. The villa has everything you need to feel at home. Set in a lovely garden with a nice family pool and pool table. Plenty of outdoor furniture to enable you to cook, eat and relax in the sun. Fabulous local supermarkets selling amazing fish. Good sized bedrooms, nice open plan living area and kitchen with ample utensils etc, use of dishwasher and washing machine. David the owner went out of his way to help us. He agreed to accept essential medical equipment and supplies for my husband. He liaised directly with the medical company and agreed to take the equipment 1 week prior to our arrival and to keep it at the villa for 3 days after we left. The equipment took up a substantial amount of room and David organised for extra help to take it in and store it at the villa, all at no extra cost to us. Nothing was too much trouble for him and he was on hand if we needed him. We love the area and have been going for years. There is loads to do and see within a short drive and I would recommend the butterfly park about 15 mins drive from the villa. If you have children both tivoli world and the aqua park are a must. If you enjoy tapas head to the back streets of Fuengirola where you will find bars selling tapas for a couple of euros and are amazing. All in all a lovely villa in a lovely area. Firstly I'm delighted, sounds like you had a great time. Secondly thanks for taking the time to write a really comprehensive review. Glad you found the backstreet tapas places, I always look for where there is a queue of locals. Thanks for leaving the Villa in the spotless condition you did, would love to welcome you back. I stayed here with my wife, and my brother and his wife, the first week of October 2017. The villa is well equiped and well laid out. The TV and internet worked well which is a bonus for Spain! We did have a slight issue with the oven overheating but the owner is aware and everything else worked fine. The pool is ample for a villa of this size. It may have been the time of year, or maybe the high hedge and surrounding un-developed land, but we did have a problem with insect bites. I would recommend taking repellants and ensuring the room plug-in repellants are working. A car is absolutely essential as there are no facilities within easy walking distance. My reason for only giving 3 stars is the access. The description of the villa claims it to be suitable for the elderly and infirm however, although the villa itself is, the access drive is extremely steep and with it being gated requires very careful handbrake control when exiting. This drive would be impossible for the elderly or infirm to walk up. Thanks for taking the time to write a review of your experience during your trip. Foe sure they are helpful to potential visitors. Obviously I'm delighted you had a good time. I agree a car or taxis are required. I would mention that although the path to the villa is steep, there is no need to walk it the 2 reserved car parking spaces are directly outside the villa and cut out the hill completely. I hope you welcome you back at some point in the future. From begininning to end we loved this place, the villa is fab, spacious, and fully equipped. the owners were the most helpful people I could ask for, nothing was too much trouble, the villa was just like being at home perfect we loved it so relaxing and peaceful. I'm delighted to hear you enjoyed your stay. Thank so much you for taking the time to comment on your experience in the villa, I think it really helps future guests to know what to expect. Agree 100% a car is a must, particularly in the summer & also agree it is very peaceful and relaxing, perfect for a family holiday. Great villa. Perfect for our family of 6. Beautiful Villa and gardens. Pool table and pool went down a treat for my Adult family. Granddaughter loved the roomy villa too. Nice and quiet retreat. Nice selection of restaurants nearby. Car worthwhile. Many thanks to Linda and Pat. Will be back again next year. Thank you so much for your lovely review and that you enjoyed the villa with its quiet locaction.. The pool table and table tennis table are always very popular with the guests particularly with children. It is ideal for privacy and a quiet location with restaurants and supermarkets etc not far away. We look forward to meeting you all again very soon. Thank you so much for your lovely review. It was a pleasure to meet you and so pleased that everything went well at the villa and you liked everything. Hopefully you will come and stay again and enjoy all the facilities of the villa and area again..
What an amazing villa had everything we needed and more beautiful scenery and great for families... very clean and well cared for..will definitely be returning... a vehicle is a must to explore this amazing part of Spain..